Berkhampstead _ Herts. June 10th 1837. J.C. Bourne del et lith. Printed by Day & Haghe, Lith.rs to the Queen. London, Published 1839 by J.C. Bourne, 19, Lamb's Conduit Street & Ackermann & Co, Strand. Tinted lithograph. Printed area 285 x 385mm (11¼ x 15¼"), with large margins. A locomotive transporting earth from a cutting, with a bridge over it under construction. Plate 15 of John Cooke Bourne's 'Drawings of the London and Birmingham Railway'. Abbey 398: 'the finest type of lithographed illustration'. 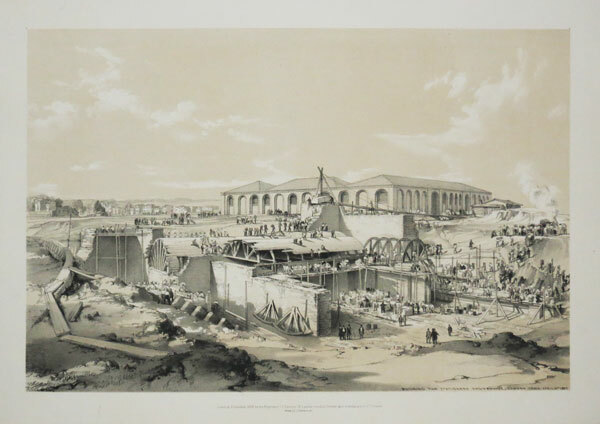 Building Retaining Wall &c Near Park Street, Camden Town, Sep.r 17th 1836. J.C. Bourne del et lith. Printed by C. Hullmandel. London, Published Dec.r 1838 by the Proprietor J.C. Bourne, 19, Lamb's Conduit Street & Ackermann & Co, Strand. Tinted lithograph. Printed area 290 x 420mm (11½ x 16½"), with large margins. Workers facing the sides of a deep cutting with brick. 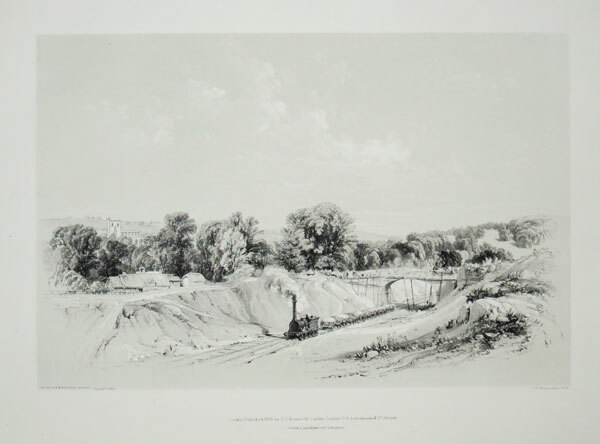 Plate 4 of John Cooke Bourne's 'Drawings of the London and Birmingham Railway'. London, Published 1838 by the Proprietor J.C. Bourne, 19, Lamb's Conduit Street & Ackermann & Co, Strand. Tinted lithograph. Printed area 305 x 435mm (12 x 17"), with large margins. The Stationary Winding Engine House hauled trains up from Euston to Camden Bank by means of an endless rope. The buildings were designed by Robert Stephenson. The building of the London-Birmingham Railway devastated Camden (Charles Dickens described the work as like 'the shock of a great earthquake' in 'Dombey & Son). The machinery installed here was only used from 1837 to 1844, but the vaulted buildings being built are now Grade II*, as a rare surviro of such structures. Plate 6 of John Cooke Bourne's 'Drawings of the London and Birmingham Railway'. 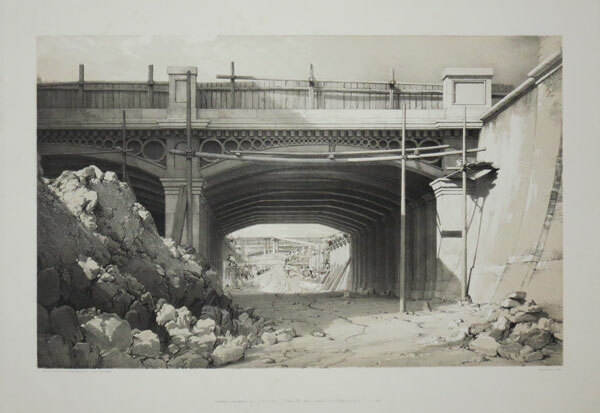 Hampstead Road Bridge. Sept. 5, 1837. J.C. Bourne del et lith. London, Published Sept.r 1838 by the Proprietor J.C. Bourne, 19, Lamb's Conduit Street & Ackermann & Co, Strand. Tinted lithograph. Printed area 290 x 415mm (11½ x 16¼"), with large margins Tears in margins, one through publication line. The bridge to carry the Hampstead Road over the new railway. 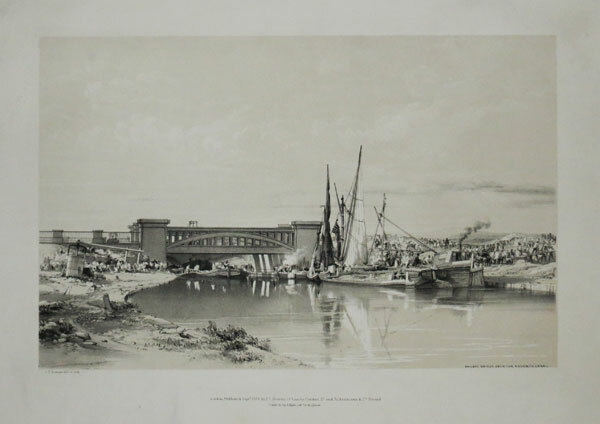 Plate 3 of John Cooke Bourne's 'Drawings of the London and Birmingham Railway'. Railway Bridge over the Regent's Canal. London, Published Sept.r 1838 by J.C. Bourne, 19, Lamb's Conduit Street & Ackermann & Co, Strand. Tinted lithograph. Printed area 270 x 380mm (10½ x 15") Tear in edge of large margins. The construction of a bridge over the Regent's Canal in Camden, as one form of transport supercedes another. 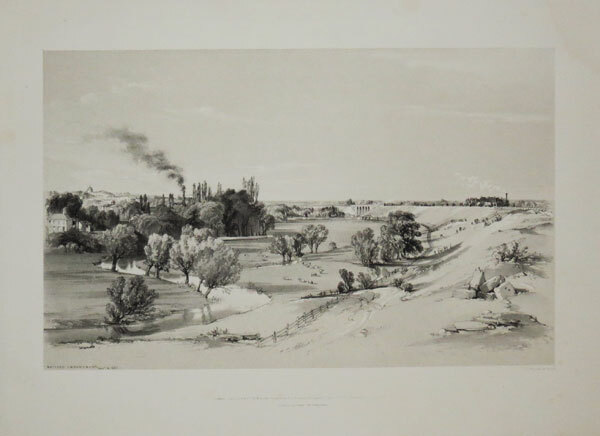 Plate 5 of John Cooke Bourne's 'Drawings of the London and Birmingham Railway'. J.C. Bourne del et lithog. Printed by C. Hullmandel. London, Published 1839 by the Proprietor J.C. Bourne, 19, Lamb's Conduit Street & Ackermann & Co, Strand. Tinted lithograph. Printed area 250 x 350mm (9¾ x 13¾"), with large margins. The 2½-mile-long Tring Cutting, lined with countless plank ramps with horse-powered winches helping men bring wheelbarrows full of spoil up the steep banks. This was one of the most labour-intensive parts of the London to Birmingham Railway project. Plate 16 of John Cooke Bourne's 'Drawings of the London and Birmingham Railway'. Watford Embankment. Nov.r 6, 1837. Tinted lithograph. Printed area 255 x 365mm (10 x 14¼"), with large margins. 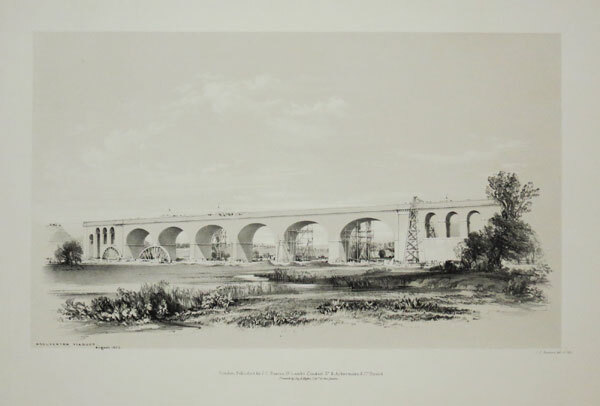 A long embankment with a viaduct, Plate 9 of John Cooke Bourne's 'Drawings of the London and Birmingham Railway'. Tinted lithograph. Printed area 255 x 390mm (10 x 15½"), with large margins. Wolverton Viaduct, built to carry the London & Birmingham Line over the River Great Ouse, under construction. Plate 20 of John Cooke Bourne's 'Drawings of the London and Birmingham Railway'. J. Weld del.t. Smith sculp.t. London, Published by Jones & Co. 1824. 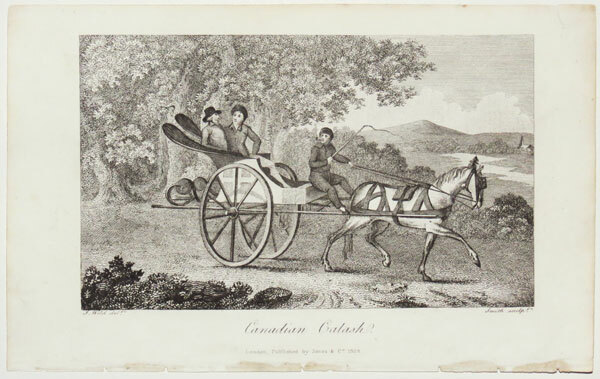 A scene showing two men riding in a Canadian calash, a light carriage with two wheels as opposed to four, and pulled by a single horse. Rare lithograph. Sheet: 190 x 280mm (7½ x 11''). Trimmed, laid on mount board. George Graham and his wife Margaret made several balloon ascents in Britain, many of which ended in disaster. The couple made this ascent in the ‘Victoria & Albert’ balloon to celebrate the Great Exhibition year of 1851. 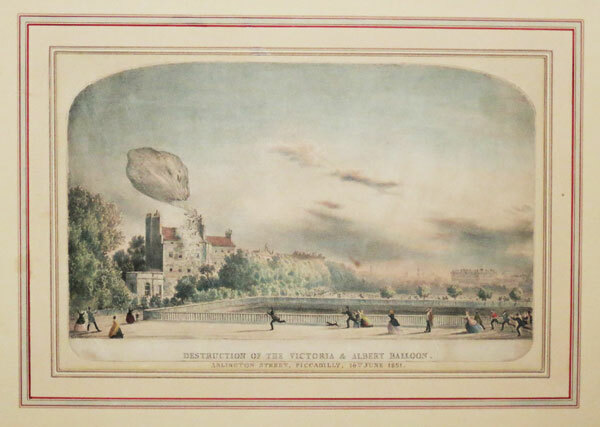 However, after narrowly avoiding a collision with Crystal Palace they lost control of the balloon, which crashed into Colonel North’s house in Arlington Street, Piccadilly, leaving the building damaged and the aeronauts badly injured.